Enjoy a relaxing morning at a private beach swimming and sunbathing. 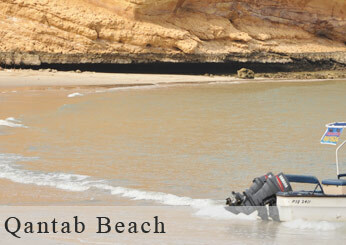 A short drive from the port will bring you to Oman Dive Centre on Qantab Beach where you can soak up the golden rays of the Omani sun, relax and swim. A welcome drink will be served upon arrival, then settle down on your sun bed and enjoy the day. Sun umbrellas and changing room facilities are also available; please bring a towel with you. A set menu lunch will be served at the Center's Odyssey Restaurant for your enjoyment. Comfortable non slippery shoes and beach attire recommended. Suitable for elderly and assisted persons with limited walking capabilities. Toilets available at the Centre. Paved walkways with approximately 5 minutes walk and few stairs at the centre. Water sports and diving equipment available at the centre payable direct at the counter. US$ and credit cards accepted.